My scholarly background includes undergraduate degrees in English, French, and art history, so I’m happy to work with literary-textual and artistic-visual objects alike. Plus, the multidisciplinary aspect of University of Rochester’s Visual and Cultural Studies PhD program foregrounds nontraditional approaches to visual materials. I’ve worked at the Museum of Fine Arts Houston, the Contemporary Austin, the Harry Ransom Center, and the Blanton Museum of Art, so I have a particular interest in curation, display, and mediation of art and manuscripts. How could I use my curatorial and museum education background to add something new to the Blake Archive? Inspiration struck. I could develop the William Blake Archive Instagram. As I suggested the idea, some understandable concerns arose. I sensed some reluctance and hesitancy. Yet, the Blake Archive itself pioneered educational uses of digital technology, much like the innovative and inventive William Blake’s deviance from traditional conventions. As a platform for contemporary makers and creators, Instagram lends itself well to educational endeavors and sharing of scholarly resources. Most prominent museums, archives, and libraries have official Instagrams with large followings. These institutions share visual and literary content with wide audiences through the application. In my time at the Harry Ransom Center and at the Museum of Fine Arts Houston, I generated materials they shared through their social media accounts, including their Instagrams. More recently, during my stint at the University of Rochester Humanities Center, I launched their Instagram and cultivated its audience over a few weeks. In each of these institutions, Instagram plays a key role in reaching new demographics who might not use more conventional web browsers as often—and for all its merits, functions, and ease of access, I would be willing to bet most people do not interface with the Blake Archive website via their smartphones. 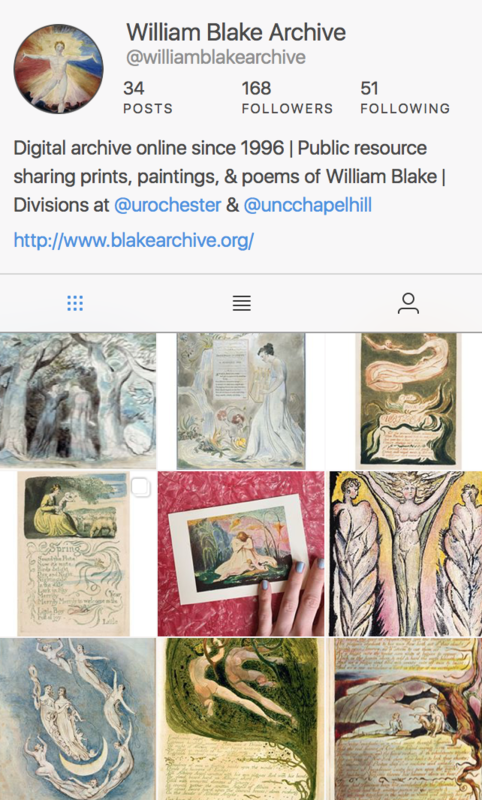 Without further delay, I introduce the William Blake Archive Instagram: @williamblakearchive. The site is in its fledgling stages. For now, I’ve populated the page with some compelling, aesthetically interesting images and their basic tombstone information. My vision, going forward, is to devote time to create narratives around the content shared. 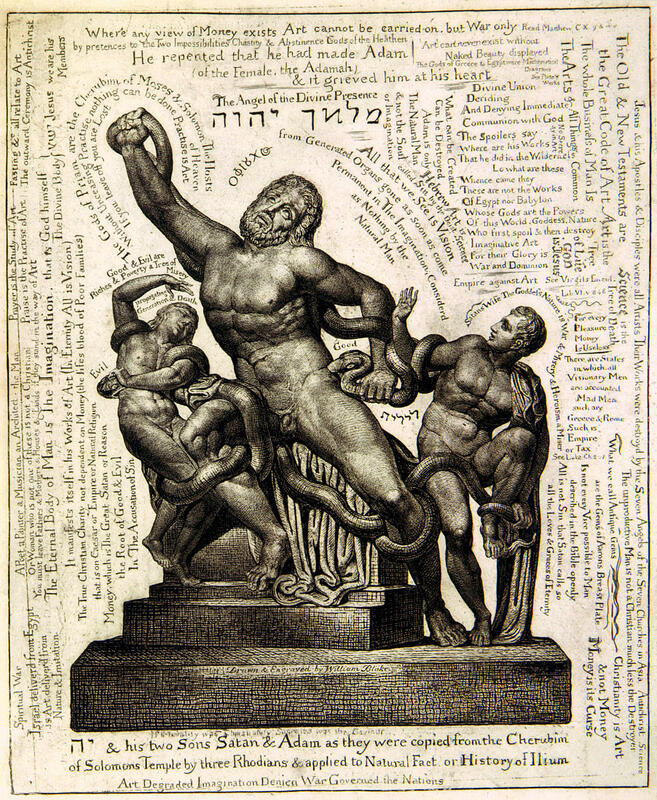 I want to share how Blake’s work connects to moments in history and to contemporary events. I want to craft thematic posts based on holidays or relevant cultural content. I want to share information about Blake’s biography, his artistic practice, and his continued influence and resonance. 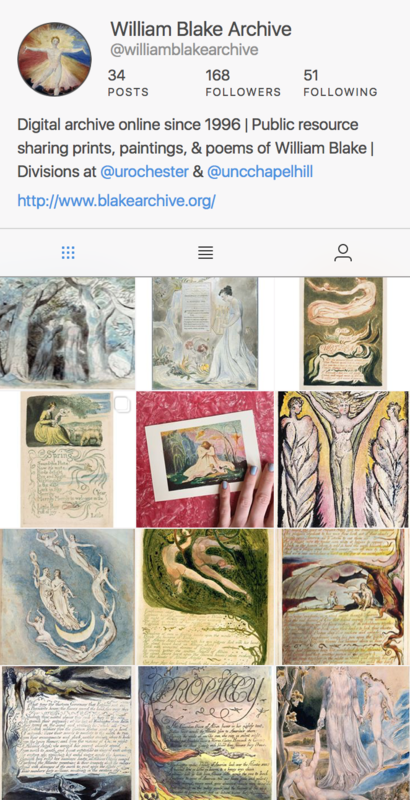 Given Instagram’s highly visual form and its capacity for lengthy textual captions, and given its massive, global presence, this application is the perfect opportunity to spread, share, and engage, and thereby further the aims of the Blake Archive.